I recently reread it and am quite proud of it so wanted to house it here on my own blog as well. It’s so easy to get wound up in this big, busy world. The to-do list is ever-growing and it seems we’re on an endless quest to expand and upgrade. I’m guilty of it too. My chase revolves around a compulsion to explore new places. I catch myself thinking of adventures and destinations like they are collectible badges, and sometimes, the impulse is so great that everything else takes second place. It’s important, in these instances, to rebalance. Thanks to photography, I’ve learnt to stay still and revel in the simple things. Through my lens, everything is broken down into frames. It helps me appreciate even the littlest aspects, instead of searching only for the outwardly grand. In these moments, it feels as though I’ve escaped the rat race - I realise I’ve already got everything I’d been looking for. 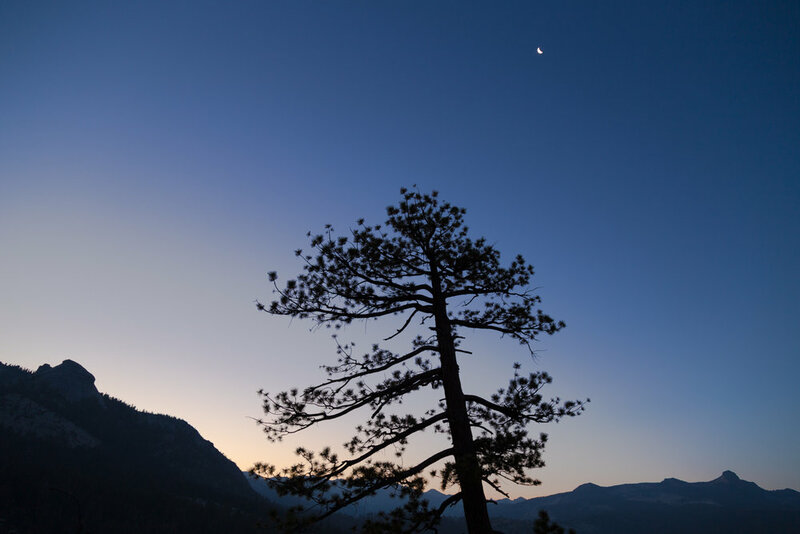 Hiking to Half Dome at dawn, I looked up to a fingernail moon, hanging delicately in the indigo sky above a pine tree. I took a quick snap and continued on, anticipating one of the most incredible experiences of our lives. Half Dome was indeed mind-blowing but when I look back, it’s this photo that always stops me in my tracks. It takes me right back to that morning when I found magic in the minutiae, in a place renowned for epic cliffs, lakes, waterfalls and trees. And I continued to find magic in the simplest scenes in Yosemite…It was 7am on our last morning and we were driving back into the Valley for some climbing. For days, we’d been in the wilderness, away from civilisation, surrounded by panoramas of granite peaks, alpine lakes and golden meadows. 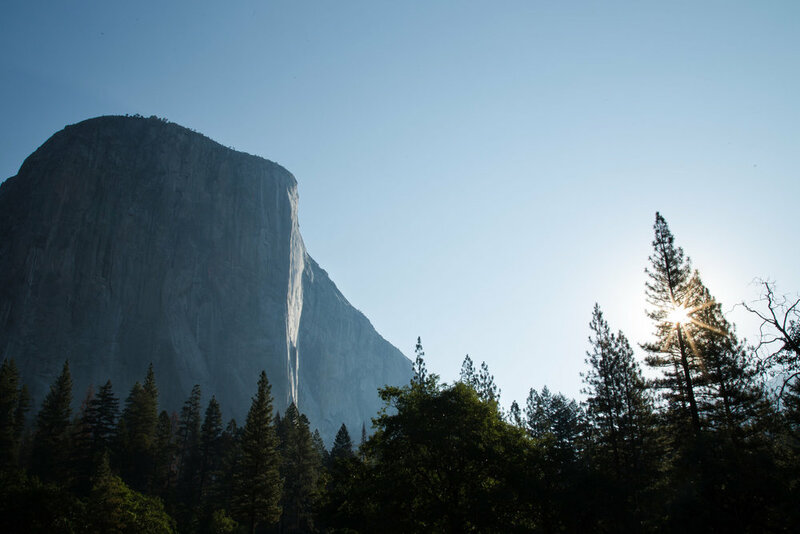 Yet, it was here in one of the world’s most touristic places, that a sun star in a pine tree and a glimmer of light on El Capitan captivated me, cementing a place in my heart for Yosemite. I arrived at Moke Lake, hoping to capture those brilliant reflections of mountains on the lake. Instead, everything was whited out. Without big mountains above, I shifted my attention downwards and as we strolled around the lake, I noticed bejewelled spider webs and tiny frosted purple thistle flowers. Then, the clouds parted just enough for this mountaintop to peek through. It was only a fraction of the scene I’d envisaged but I love the subtlety of it. Zion’s canyons and narrows are magnificent but what I became obsessed with, was the shape, patterns and hues of the rock on the lesser visited East Rim. Slickrock had been sculpted into waves of orange and white, walls streaked with pink and dotted with green pines and rock carved into perfect conical formations. To someone else, it may have just been rock. To me, it reinforced something that I’ve said before - the best art is found in nature. This channel down the southern end of Seal Rocks Bay had me in a trance. The ebbs and flows were inevitable but the power and volume always varied; it was this mix of predictability and unpredictability that hypnotised me. I saw so much meaning and metaphor in it. When the sunlight broke over the rocks and bounced off the waves, I finally created an image that represented the pull this place had on me. One morning, I woke up at 4.30am and drove to the Blue Mountains to shoot the sunrise. Poor planning meant I went to a lookout that did NOT face east. As I watched an obstructed view of the sky behind me ignite, I almost wrote off the entire day as a massive failure. But I stayed, lowered my camera, took a breath and looked at the expanse of wrinkled hills in front of me. I tried to remember that no matter what comes next - in this case, whether or not I get the ‘money shot’, I am lucky and this world is beautiful. Then, the sun rose a fraction higher and sent its rays splitting over Mount Solitary, revealing a rainbow that danced above the mountains. It felt specially reserved for me. This is my most recent reminder that there is always beauty in the world and it can manifest in simple ways but with great impact. I just need to move slowly, stay open and look out for the details and eventually, all the little pieces fall into place to reveal that one big and grand picture.